The computer labs on the ground floor of the Computer Science and Information Technology Building (CSIT) at the Australian National University are due to be re-equipped. Rather than just replace the old computers with new ones, I have suggested turning the entire ground floor (about 800 square metres) into a teaching and learning commons. The award winning CSIT Building was purpose designed for computer science in the mid 1990s, with input by computer scientist Dr. David Hawking. The building was ahead of its time being designed for high performance computer data cabling and work environments have been provided for undergraduate and postgraduate teaching, as well as project work. The ground floor area originally had a seminar room (the famous N101), two smaller project rooms N118, N102), a computer museum in the foyer (N120), two tutorial rooms (N108, N109), five smaller prac rooms (N110 to N114), and two larger prac rooms (N115, N116). Later N110 and N111 were re-purposed as postgraduate rooms. Half the dividing wall between the larger prac rooms (N115, N116) was removed to make a larger computer equipped teaching space. The remaining prac rooms (N112 to N116) are equipped with parallel benches running down the room fitted with desktop computers. There are projection screens at the front of the rooms. There is a student foyer near the main entrance, this has a notice board shared printers. The computer equipment is due for replacement. However, this provides the opportunity to rethink the use of the space. The facility was designed with a bifurcation of teaching practice on the main axis. 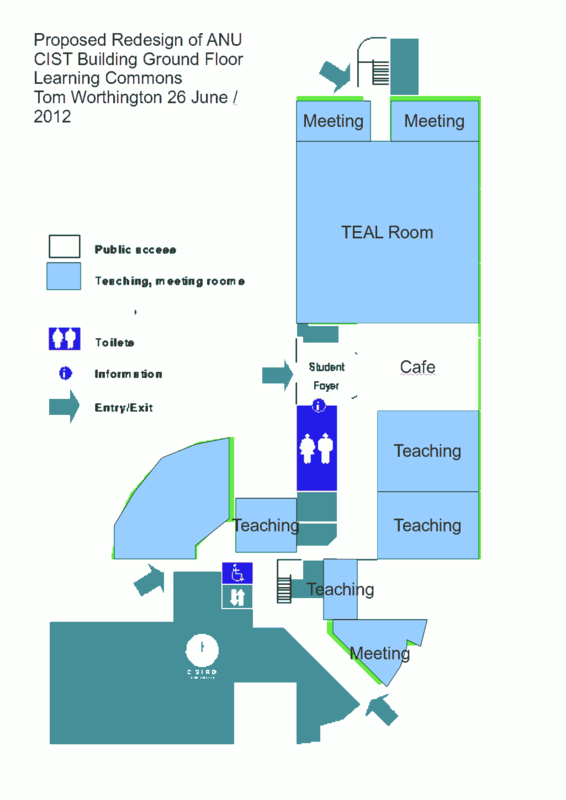 There are tutorial rooms on the southern side of the main corridor and prac rooms (computer labs) on the northern side. The tutorial rooms were designed for medium sized groups using conventional face to face teaching techniques lead by a tutor (without computers). The prac rooms were designed for individuals or small groups of students to work, with or without supervision, but without formal presentations. The prac rooms have now evolved to allow for group instruction, with a presenter at the front of the room, as well as continuing to be used for small group and individual work. Individual and small group work has different requirements to large group work and there is there for a compromise in the room design. This is seen most obviously in the combined room N115/N116, which has a half wall down the centre of the room. This wall allows the room to be used for two small separate groups, but when used as one large room half the class can't see the other. The ANU Research School of Computer Science is a leader in the development of open source software and operating systems. ANU uses a mix of Apple Mac and Microsoft Windows operating systems. There are also new options with students using their own laptops, net books and tablet computers. The use of "cloud" computing and web based interfaces is rendering the issues of the desktop hardware and operating system used to be largely irrelevant. It is suggested that students, particularly Computer Science students should be expected to have their own mobile computing device, be it a laptop or tablet. The unviersity then just need to provide wireless networking to the learning management system and major computing resoruces. In the last few years ANU has made a major investment in e-learning with the development of the "Wattle" system using the Moodle learning management system and related software. CECS is a leader in the use of this technology for blended learning with the Engineering Hubs and Spokes Project and for e-learning with the award winning ICT Sustainability course. As a result CECS will require fewer large lecture theatres seating hundreds of students and more small computer equipped flexible teaching rooms seating 24 to 48 students. Also space will be required for students to work alone or in small groups with computer access. This creates both an opportunity and a problem. The Colledge will not need to use external lecture theatres as much (these spaces being unsuitable for modern teaching practices) but will require new spaces for teaching. Other colleges, such as commerce and law have constructed new buildings with "Harvard" style rooms for group teaching. However, there is not the space, nor is there likely to be the funding for the construction of these in the CSIT building. Also these Harvard style rooms are not optimal for modern teaching as they do not have a flat floor. Fitting the conflicting requirements into a small space in the CSIT building is a complex task. However, some recent developments in teaching space design can be adapted. Advances in computer technology can also make the task easier. 1. Retain Seminar Room: The existing N101 seminar room should be retained essentially unchanged. The previous raised platform at the front of the room has already been removed, to provide a flat floor for the entire space. 2. Re-purpose display room: The current computer display room at the entry to the building is not effective. The exhibits could instead be provided on flat panel wall screen in the foyer and the room used for meetings. 3. Remove Desktop Computers: Using the approach suggested by Dr Kathy Lynch at the University of the Sunshine Coast, the ground floor of the building could be modeled along the lines of a high technology business of the type IT students would aspire to work for (or own). To achieve that look, the central entrance and open plan area could be remodeled as the entrance and reception area. This would provide a place for students to meet and to find out about activities. This area would be also used during breaks in evening courses when the refectory areas of the ANU may not be open. The current prac rooms have a very low seating density, resulting in great flexibility but limited capacity. It suggested that all desktop computers be removed and students required to bring their own mobile device instead. This will then allow the large fixed benches to be replaced with smaller fold up tables on wheels. It should also allow the space to accommodate twice as many students overall. The foyer would be equipped as an informal "cafe" with tables and benches equipped with power points for student laptops. Some spaces would be equipped with wall mounted screens for small group work by students. These could be modelled on the UNSW Eora Exchange (by lahznimmo architects) and the Southbank Institute of Technology Library. Other useful examples are the University of Canberra Teaching and Learning Commons, ANU Hancock West, and University of Adelaide Hub Central. 4. TEAL Room: The internal walls would be removed from the western end of the ground floor to create one large 18 x 18 m "TEAL" room, like that at the University of Canberra Inspire Centre. This would accommodate classes of up to 120 students. The TEAL room would open out onto the cafe. If computer based examinations need to be accommodated, then the TEAL room could be lined with aluminium foil insulation, which would block most external wireless data access. Students could use their own laptop, a specially filtered WiFi system and a monitored, hosted IT system for their examinations. Students would only be permitted to use their laptops as terminals to the examination server, with any data copied from elsewhere detected and reported by the system.